Visitors could see the footage of the two new releases that promise plenty of action. ICE Totally Gaming is definitely one of the industry’s biggest annual events, and this year’s edition was no exception. And one of the biggest names in the industry was present at ExCel in London, ready to showcase its brand-new content which should captivate players around the world in the coming period. The developer we’re talking about is, of course, Microgaming, who premiered a number of new video slot games. The list of new additions to the company’s extensive portfolio of video slot includes two new games – Banana Odyssey and Shogun of Time. All those who visited Microgaming’s stand had the chance to see the footage of the two new releases, which promise plenty of action, as well as immersive and dynamic gameplay. 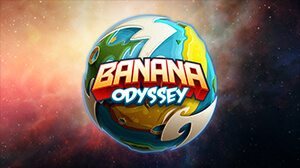 Banana Odyssey is a space-themed slot and is ready to take on players at Microgaming casinos all around the globe. Developed by Slingshot Studios exclusively for the Isle of Man-based gaming giant, Banana Odyssey features five-reel three-row layout, with two chimps as the game’s main characters on a thrilling mission to the Banana Planet. This action-packed slot offers several exciting and potentially lucrative features, such as expanding wilds, respins and free spins, ready to award rewarding prizes to those with enough luck. The concept of this slot was revealed during the company’s Games Concept Day and was the winning concept of this event. But Banana Odyssey wasn’t the only new game presented at ICE. One of the slots which debuted in London was Shogun of Time, which will hit the market this week. In addition to this, all the visitors had a chance to see the new Lara Croft-themed slot, titled Lara Croft Temples and Tombs, created through Microgaming’s longstanding partnership with Square Enix. Microgaming’s reveal of several new games at ICE comes only a couple of days after the company announced its popular Mega Moolah game had awarded another progressive jackpot prize. The latest life-changing prize, worth €13.3 million, was awarded on January 30, 2019, to a lucky punter at Zodiac Casino.